There are only a few desserts my Dad will eat. As I've said in previous posts, he does not have a sweet tooth. He does love coconut custard pie and he let it be known that there was none served on Christmas. 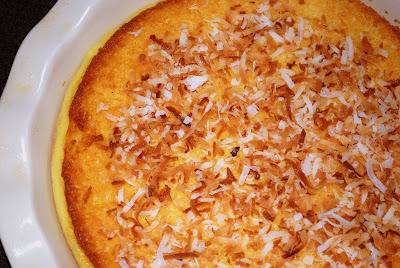 Yeah, yeah I didn't make coconut custard pie....um I was a little busy making 20 other things! So with my Dad's guilt trip laying heavily on my mind I decided to make him coconut custard pie for New Year's Eve. Problem is.....we are getting a bit of a little snow storm right now. 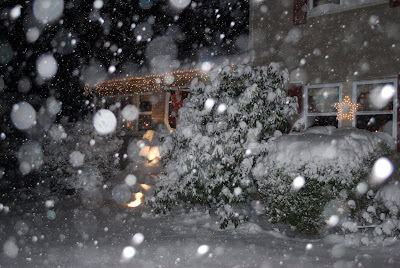 In fact the snow is rapidly piling up as I type this. My Dad, who has had a corneal transplant, can't drive in the dark, and won't let my Mom drive in the snow, so I have probably just made a coconut custard pie for someone who won't be showing up at the party. Dang. Someone will eat it. Anyway off I went to take a photo for the blog. I had to remove the obligatory piece for the photo and I did take a tiny sliver of said piece, just so I could give my honest opinion of the flavor of course. It was rich, creamy, coconutty and custardy (just in case you were wondering). In the winter months I take most of my photos in my garage with the door open so I can take advantage of the natural light. This morning was no exception. As I pushed my table up as close as I could to the garage door without actually being outside, in my pajamas, in the snow, the snow started to drift into the garage an onto my pie. 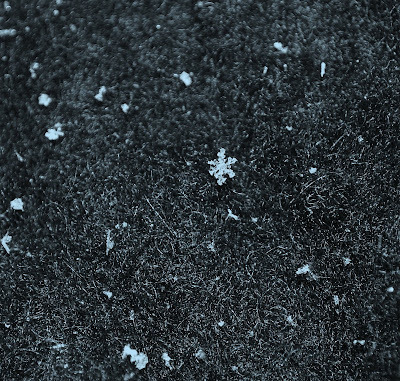 At first I was frustrated and grumbled a little, until I saw this perfect little snowflake. Then another, then another. I was squealing at this point. 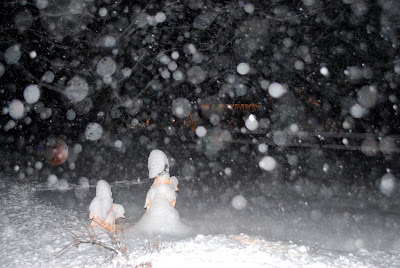 I had poor John taking a scarf and sticking it out into the falling snow to try and capture a few more. Problem was, they melted almost as fast as I could take the picture, but I did catch just a few. Now if I only had a macro lens. This is my favorite one. See it off to the left? Just look at how beautiful it is. Looks like a little jewel. 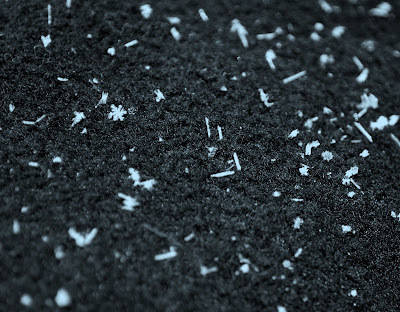 This one looks just like all those snowflakes you drew as a kid. Well at least I drew them as a kid and they almost always looked like this one. 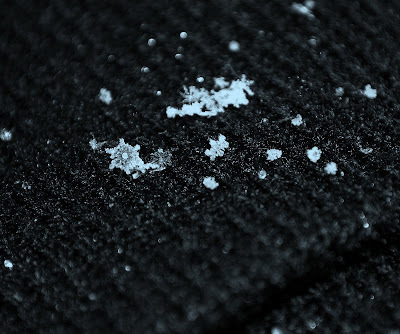 The last one I captured was this teeny tiny little baby snowflake. I cropped the hell out of the picture just to be able to see it. It's off to the left too. Really I wish you could have seen how minuscule it was. Ok enough flakiness, back to the pie. Not only is this pie easy to make, it makes it's own crust! Honest, I'm tellin' ya, it's just unreal. Oh and another thing, you make it in the blender! Only a blender to clean. How's that for easy? Preheat the oven to 350 and spray a 10 inch pie plate with cooking spray and dust with flour, or just use Baker's Joy like I do. Place everything but the coconut into a blender. Blend for about 20 seconds. 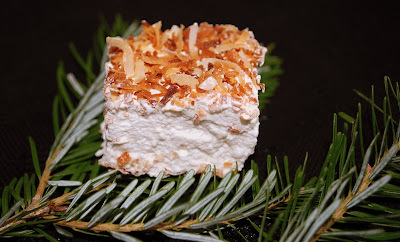 Add the coconut and pulse just a few seconds. Pour into the pie plate and bake 50 - 60 minutes. 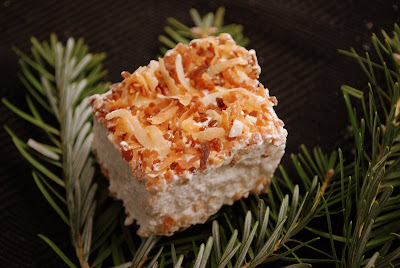 I toasted up some coconut and sprinkled it on the top as soon as it came out of the oven. It will look a bit puffy when it comes out, but it will deflate as it cools. Next time I might decrease the sugar just a tad. It was very sweet. 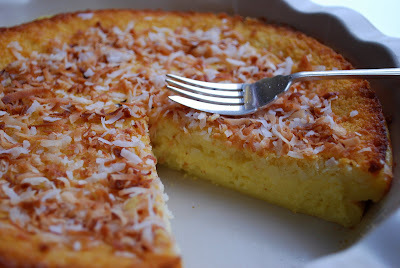 All in all if you like coconut custard pie and want to make one in a hurry, this is the pie for you. 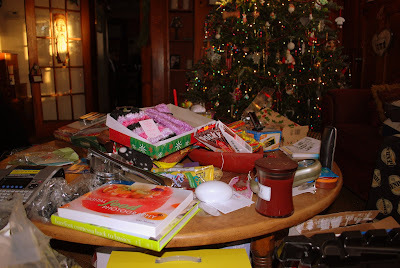 Every year the few days after Christmas become clean up and organize days for me. I'm ready for the tree to come down and have my house back to normal again. 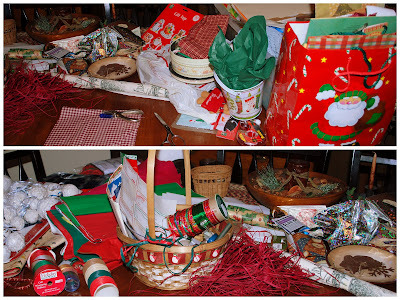 Don't get me wrong, I love Christmas and all the decorations that come along with it, but after a month of it, my obsessive compulsive side starts to creep back in and I need to clean it all up. I am resisting taking the tree down cause my friend Tati always yells and me and tell me I have to leave it up until after New Years, which kills me, but I'm trying to leave it up for her sake. We'll see. Part of my clean up project yesterday was re-arranging my computer room. I'm on the hunt for a new desk (in black) and wanted to move all the furniture around and really give the room a good cleaning. Unfortunately for John this meant spending over an hour behind the computer desk unplugging wires. I got a nifty label maker for Christmas so I was happily spitting out labels for each little wire he brought to me. Now everything is neat and organized and labeled. Makes me so happy. Later that night I scoured through my cookbooks for ideas for my New Years Eve party. We are doing mostly appetizers and picky foods, but a party at my house always includes dessert. 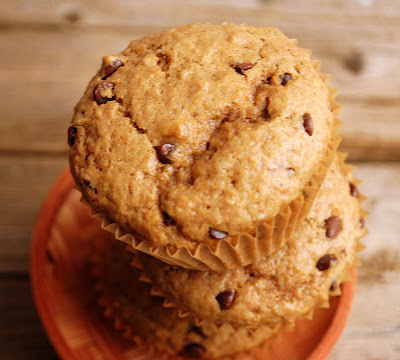 In my search I came across a recipe I had clipped out for Cappuccino Muffins. Although it wasn't a New Years Eve food I decided I needed to give these a try. So this morning I whipped up a batch. My house smelled like a Starbucks. The cappuccino smell that was coming from the kitchen was so yummy. Evan's friend had slept over. 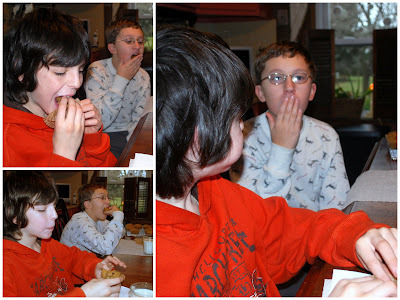 The boys stumbled down the stairs, popped a few into their mouths and declared them delicious! These are a snap to make, are loaded with little explosions of chocolate and have a rich cappuccino taste. If I drank coffee I'm sure I'd say they go great with coffee, but I'm not a coffee drinker so I have to say they go great with milk! In a bowl combine flour, sugar, baking powder, cinnamon and salt. In another bowl combine the milk and instant coffee and stir until dissolved. Melt the butter and let it cool for a few minutes. Add the egg and vanilla to the butter and mix lightly. Add the wet ingredients into the dry ingredients and mix just until moistened. Please don't over mix your muffins....terrible things will happen! Fold in the mini chips. 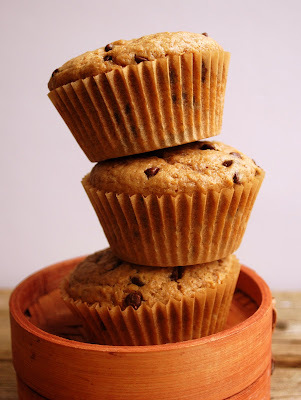 Fill a paper lined muffin cup 2/3 full. Bake at 375 for 17 - 20 minutes, or until muffin tests done. Cool for 5 minutes before removing from pan to wire rack to cool. 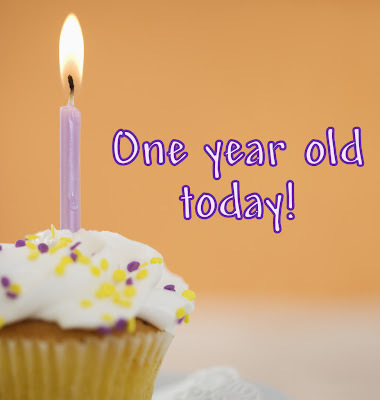 It's hard to believe that one year has passed since I started this blog. I remember being ecstatic when I saw that ten people a day checked in to see what I was up to. Ten! Imagine that? For those of you who weren't around then, here's a look back at my very first post. 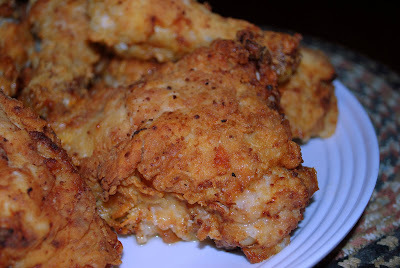 I have had some friends tell me they wish I would post my recipes, pictures, even my thoughts and ideas. I never really thought that I was interesting enough for anyone to want to read any of it. We shall see. I named it The Cutting Edge of Ordinary. Please don't think that ordinary is a bad thing. I am ordinary. My life, my job, my skills, all ordinary. I think it's the ordinary in the world that connects us all. What is extraordinary is the family and friends I surround myself with. Most of which I am sure you will meet in upcoming posts. You will not be disappointed. So here is my first post on my brand spankin' new blog. Pretty ordinary so far. 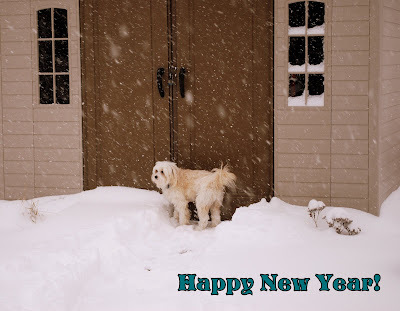 Here's hoping 2009 brings even bigger and better things to The Cutting Edge of Ordinary. Thanks for sticking around. and a new one just begun." We had a great Christmas. It was loud, there was lots of food, it was messy but most of all it was fun. The boys and their cousin had a blast on Christmas Eve. 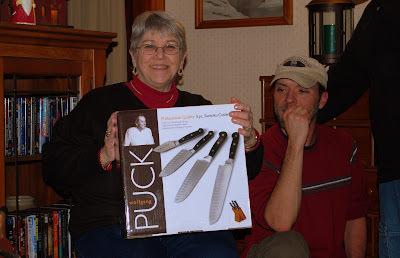 I got Mom the Wolfgang Puck knives she had been eyeing. There was lots of loud discussions, mostly involving movies and music. 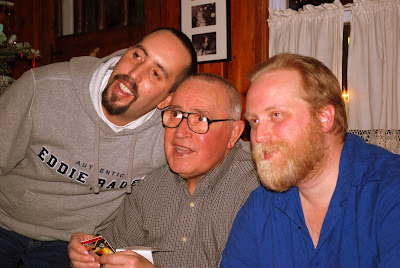 My brothers and Dad got together for this nice shot. 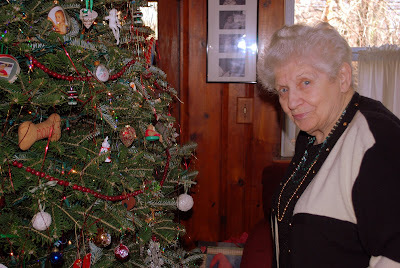 Gram came for Christmas Day. She's my Gram and the boys great-grandma. She'll be 85 in March and she has Alzheimer's. Were not sure if she even knew it was Christmas, but she did know that there was chocolate and sweets, and that's plenty enough reason for her to celebrate. 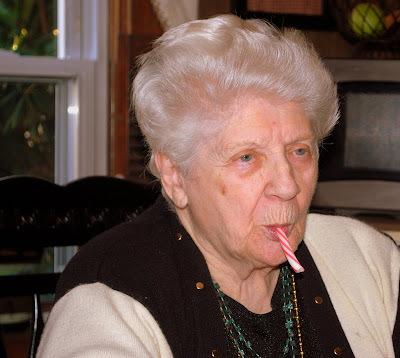 She ate 9 brownie bites, cheesecake, a handful of fudge, a dozen hard candies and 2 canes canes. All that after she picked at her "real" food. The lady has a wicked sweet tooth....worse than mine! She was sucking on a candy cane, making faces at me. It was so funny. She also had a klepto moment yesterday (very common with people with Alzheimer's) She went to use the bathroom and came out wearing 2 of my rings on one of her fingers. When she sat down my Mom noticed and questioned her. "Mom where did you get those rings?" "These?" she said pointed to my rings on her finger. So she takes them off and I can now see that they are two of my rings. I whispered to my mother, those are mine. "Mom these are Lisa's rings"
"They certainly are not, those are mine" my Grandma protested. You can't argue with someone with Alzheimer's. There is no point in it. We just quietly slid them across the table and she forgot about them. Then I went into the bathroom and hid all my jewelry. We all had a laugh, which confuses poor Gram even more cause she has no idea why we are laughing, but she giggles along anyway. She looks like a little imp standing near the tree. 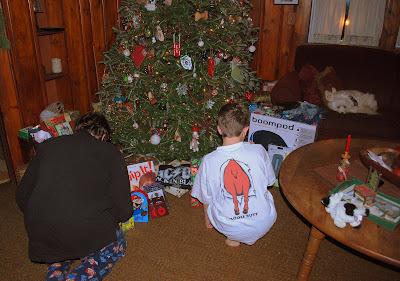 Here are the boys minutes after they came downstairs to see what was under the tree. It was 6:00am. Both of them quietly surveying what loot they received. There were no yelps or screeches like in years past, just some quiet spoken "oh cool's" and "check this out" and "awesome's". I guess they are growing up. I miss the screeches and yelps. Here is my living room at 6:07am, and this is only half the mess! Moose so kindly serenaded us with his rendition of Rudolph (it's his favorite Christmas song). 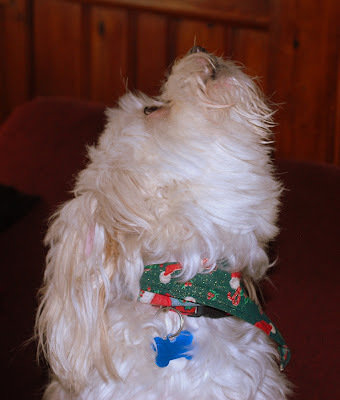 Here he is singing (we call it howling, but shhhhh never to his face, we wouldn't want to hurt his feelings). All in all we enjoyed a great Christmas. Tonight we celebrate with a few more friends, some more food and then prep for New Years begins! 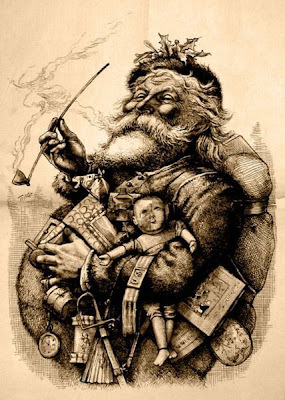 Hope you all had a great Christmas too! I hope the next few days find you surrounded by people you love. I hope you laugh and smile more than you have all year. I hope you are with those who make you happy, eating great food, telling great stories and making wonderful memories. 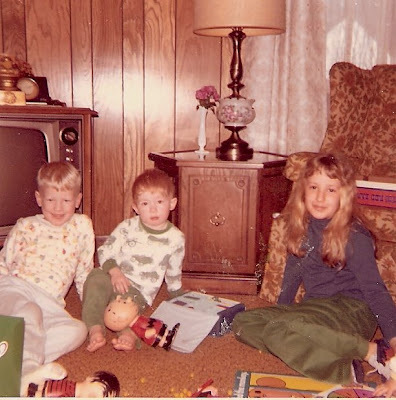 I thought I'd have a little blast from the past and share a few Christmas photos of me and my brothers from the 70's. You know, way back then. 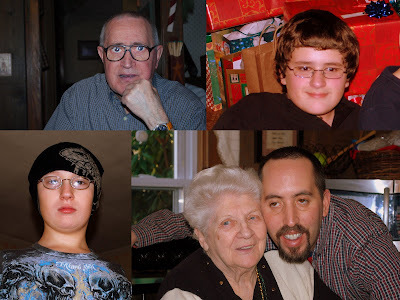 You'll notice an absence of my youngest brother in the first few photos. He didn't come around till a bit later. 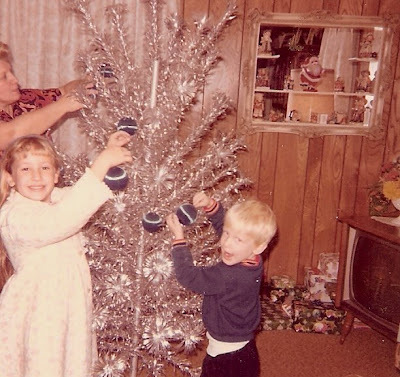 Yes we had a Tinsel Tree. I hear they are so all the rage now. Pity we didn't keep it. I'm guessing this photo was taken around 1970. My mom was not so good about writing the dates down on the pics. 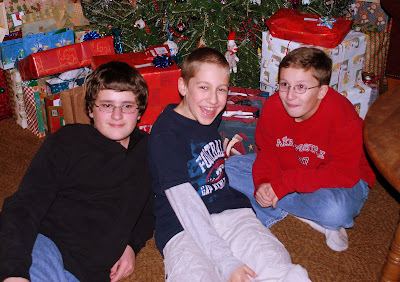 The kid with the white hair is my brother Jay. He's 40 now and his hair is still white. I believe this was the following year. 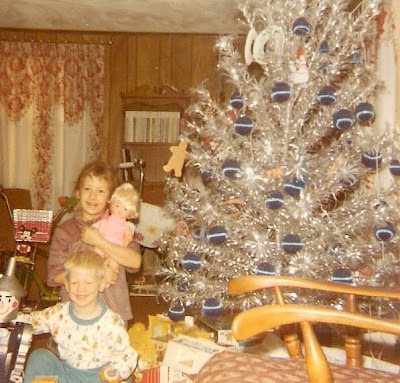 Yes the Tinsel Tree is still with us, same ugly blue satin ornaments. This was the year of the new bikes. See that bike basket behind my head? I loved that thing. Big plastic daises on it. I was stylin'. I think this was '72. I asked for a Fancy Curl. You know, one of those big giant doll heads that you could put makeup on and curl the fake hair? It came with a carrying case too. Fancy indeed. Oh and check out that plastic Santa decoration on top of the TV? My mom had a whole set of them...reindeer's and angels too. She hung them in the windows for years and years. They always creeped me out. I believe this next one was around 1973. My cousin Tom is the redhead in the middle. I remember those Charlie Brown plastic dolls. I should have hung on to them, there probably a collectors item now.....along with my Mom's Tinsel Tree. 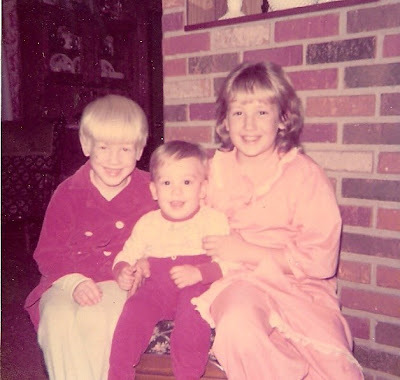 This was our official Christmas photo for 1972. My brother Mark was just a year and a half old. 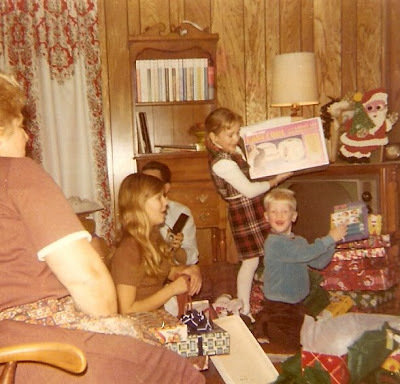 There's not a whole bunch of Christmas photos after 1972. I think my Mom was getting tired. Thanks for taking this little trip down memory lane with me. I hope in 30 years or so one of my boys will be looking back through all my photos and reliving some of their Christmas memories. I'd also like to thank all of you who take time out of their busy days to read my blog and share your thoughts, recipes and time with me. You have no idea how amazed I am that anyone other than my family reads this. 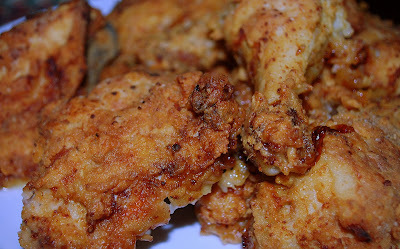 Extra thanks to those of you who consistently comment and make the recipes I post. Bless your hearts. I'm still tickled every time someone emails and tells me they love my blog or they have made one of my recipes. I have a lot of fun with it. Hopefully 2009 will bring me to the next level of blogging where I can put my creative side to good use. There's lots to be done, so be patient with me in the beginning of '09. I think it's going to be a very good year. It's true. 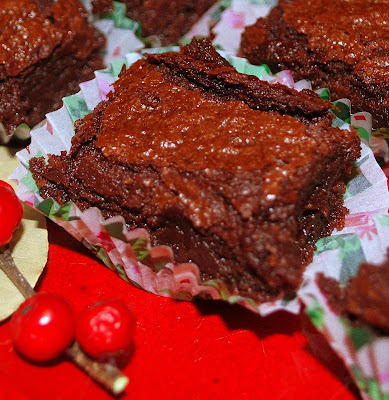 You can make fast, easy fudge in 5 minutes...and it tastes great! 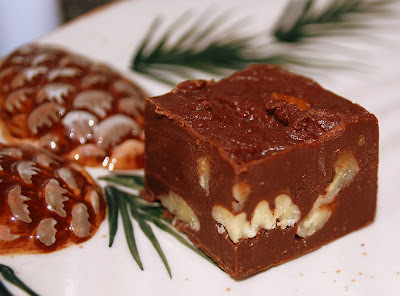 I've been making this fudge for Christmas for a couple of years now. There's no messy marshmallows fluff to deal with, there's no boiling, no candy thermometers. It's fast and it's super easy to make. 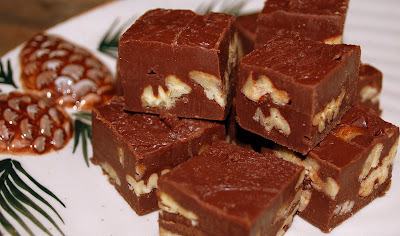 You can use any kind of combination of chips you'd like for this fudge. I find it works best with a base of semi-sweet and then you can vary the 9 ounces of other chips. I've had great success with the mint chips, the white chocolate chips and the peanut butter chips. First prepare your pan for the fudge. I usually use a 8x8 or similar size pan. 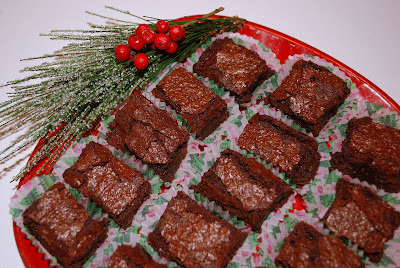 Line the pan with foil and spray it with cooking spray (I use Bakers Joy). Set aside. Next chop your nuts so they are ready to go into the melted chocolate as soon as it comes off the stove. You can use any kind of nuts you like...almonds, walnuts, pecans, hazelnuts. 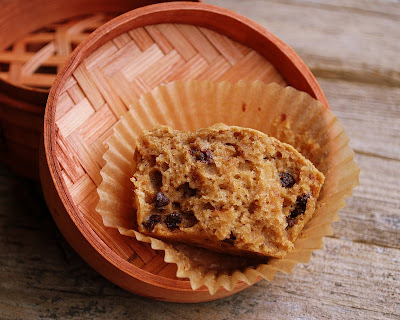 You can even substitute dried fruit if you'd like. This really is a recipe you can make your own. Then you make a double boiler of out 2 pots. How? Place a heavy pot on the stove and fill it with about an inch of water. Heat the water over low heat (don't let this boil!). Find a smaller pot that will fit into the bigger pot but not touch the water. Into the smaller pot place the chips and the condensed milk. Stir until the milk and chips and melted and combined. As soon as the chocolate is melted add in the vanilla and nuts and stir it up quickly. This will set up fast, so you don't have a lot of time. Place the mixture into your pan and smooth out the top with a cake spatula immediately. If you'd like to garnish it with more nuts, now's the time to do that too. Then pop it into the fridge to set. That should take about an hour. Pull the foil out of the pan and peel it away from the fudge. 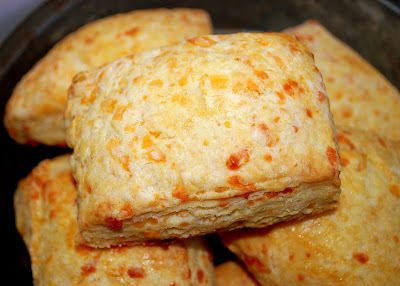 Cut into bite size pieces, serve and listen to your friends and family marvel at how delicious it is! 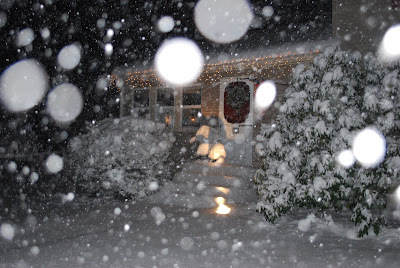 It's still snowing in Rhode Island. I can't believe it myself. Just flurries now. 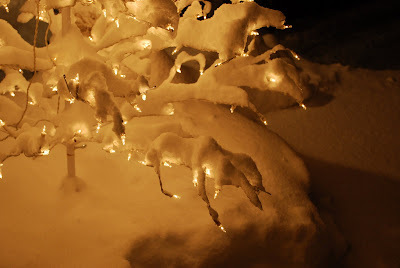 We have about a foot of snow on the ground and more expected for tomorrow. John must have used the snow blower about 5 times since last night. 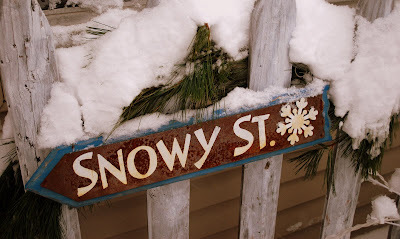 Living in New England you just get used to snow as part of life here in the winter. That's not to say many folks don't complain about it. There are still people who make a mad dash for bread and milk when they here a storms coming. We usually hit the liquor store. I mean I can make bread and I always have at least 2 gallons of milk on hand. Bread and milk?? I never got that. What are they going to do, make French Toast? 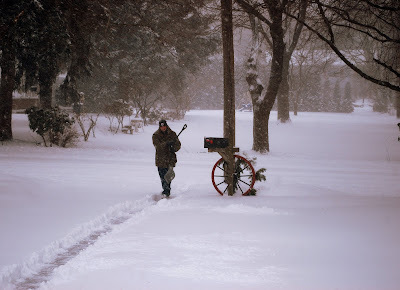 Being the hearty New Englanders that we are, we headed out to the store today. I needed to pick up just a few last minute items on my list. The ride was quite beautiful. 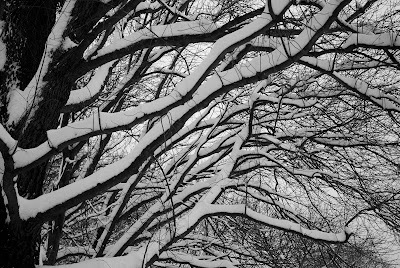 The snow insulates all the sounds so everything sounds muffled and quiet. We had Bing & Nat on the radio serenading us while the snow was slowly falling. It really was a lovely, slow ride. People were bundled up in their boots, warm hats and scarfs. Everyone also seemed to be in a great mood. I'm off to bake, but I thought I'd share a few photos. I'm hoping to go dot com in 2009 so I can post bigger photos. Sometimes blogger just doesn't do them justice. 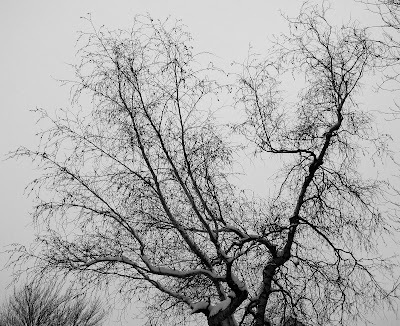 I love the look the the snow on the trees and the deep winter sky. I know lots of people who hate the snow. "Then move." That's the answer they always get from me. We are going on our 7th hour of snow. There's 10 inches on the ground and it's not stopping. We are all warm and cozy in the house. I made 10 dozen dog biscuits and 3 dozen cookies. It's so beautiful and peaceful outside. I love weekend snow storms. Sunday night I was flipping through the channels looking for something to watch while I laid on the couch. I just needed some 'do nothing' time to completely veg out. Almost Famous was on. Now I've seen Almost Famous about 20 times. It's one of my favorite movies. I own it on DVD and could pop it in anytime I want, but whenever I see it on TV, I stop to watch it. I'm the same way with My Big Fat Greek Wedding or Muriel's Wedding. I just can't pass them by. The soundtrack of Almost Famous is incredible. Every song I hear brings me back to a memory of my youth. I knew I didn't have 2 hours to watch the movie again, but I waited because I knew that there was a song coming up and I wanted to hear it again. Led Zeppelin's That's the Way. Possible one of my favorite LedZep songs...ok I love Kashmir and Going to California too but this song makes my heart happy. I was in high school in the late 70's when LedZep was King and my friends and I adored them. I had Robert Plant plastered up all over my bedroom walls. I even joined the fan club. I listened to my Led Zeppelin albums (yes albums!) so many times I thought I would wear them out. Thanks goodness cassette tapes came out so we could take LedZep with us in the car. Every song brings me back somewhere. I remember when the neighbor across the street was practicing with a bunch of girls who were in the high school Color Guard and my best friend Kathy and took the speakers from my stereo, put them in the windows and blasted Black Dog out into the streets. Man were they pissed. I distinctly remember laying on a blanket with my girlfriends in Goddard Park with That's the Way playing from a cassette player behind my head. Off for summer vacation, not a care in the world, loaded up with coconut oil, sun shining down on us...like the song says...nothing really matters. The graphics on this video dont change, you just need to listen and enjoy (hey I know it's not a Christmas song and 'tis the season, but I love it). I saw Ina Garten make this on Barefoot Contessa last week and I immediately went and added it to my "to make" list. Yes I really do have a "to make" list. Its housed in a big wicker basket that sits on top of the computer desk. That basket it chuck full too. I made a big batch of Chicken Escarole soup yesterday and wanted something different to go with it. This was perfect, and couldn't be any easier. I can see myself making lots of different variations of this. Use different meats and cheeses to turn it into your absolute favorite combination. This ham and Gruyere version was simply wonderful. 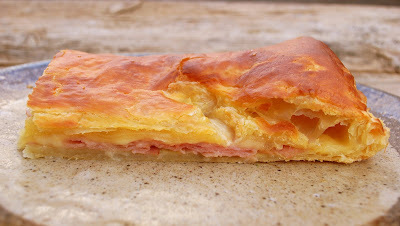 I adore almost anything made with puff pastry, but the savory cheese and ham really hit the spot on a cold winter day. I read the reviews of this recipe before I made it and noticed that most of them suggested using more ham. I used a half pound of ham instead of the 1/4 suggested. It was the perfect amount. This would make a really impressive appetizers to bring to a party too. Preheat the oven to 450. Place a piece of parchment paper on a sheet pan. Lay 1 sheet of puff pastry on a floured surface and carefully roll it out to 10 x12 inches. Place it on the sheet pan and brush it with the mustard, leaving a 1-inch border around the edge. Place a layer of ham, then cheese on, also leaving a 1-inch border. Brush the border with the egg wash.
Place the second sheet of puff pastry on the floured surface and roll it out to 10 x 12 inches. 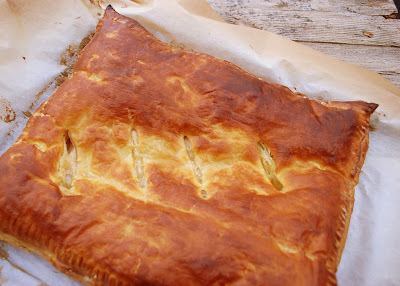 Place the second sheet on top of the filled pastry, lining up the edges. Cut the edges straight with a small, sharp knife and press together lightly. Brush the top with egg wash and cut a few slits in the top to allow stream to escape. 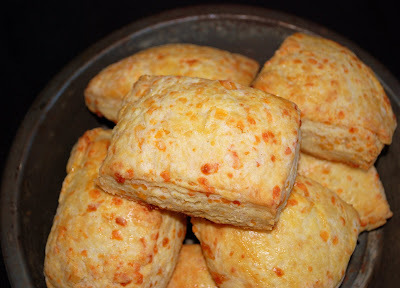 Bake for 20 to 25 minutes until puffed and golden brown. Allow to cool for a few minutes and serve hot or warm. I totally just sounded like Professor Hinkle from Frosty the Snowman. Remember him? He was the magician who said "Busy, busy, busy" and "Messy, messy, messy". Well I was both of those yesterday. I was in whirlwind! Up bright and early wrapping. I wanted to get everything finished and off my mind. Four hours later...finished! Whew! I feel so much better. My kitchen looked like a cyclone had hit it for a bit. Paper, tags, material, ribbons and raffia all over the place. The mess was so big I had to take two pictures to capture it all. Not only did I wrap gifts, but I individually wrapped over 50 snowballs and 15 sets of primitive candy canes. I put together 6 large gift baskets and 6 more smaller gift baskets. 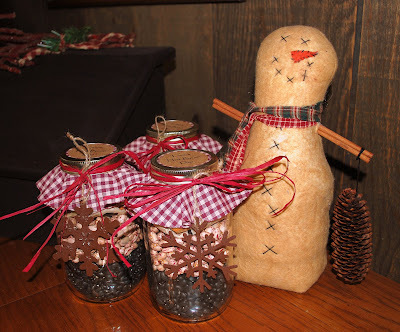 I also worked on decorating my Hot Bean Dip jars, which are going to be given to some people on my list. It's a really cool idea that I got from The Pickled Pepper Patch. 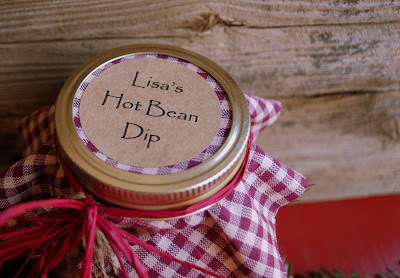 It includes almost everything you need to make a batch of bean dip in your crock pot. I just cut out some gingham to pretty them up. Then I attached a label and some raffia to hold a cute primitive ornament on each one. Lastly I attached the recipe which I laminated and hung from the raffia. 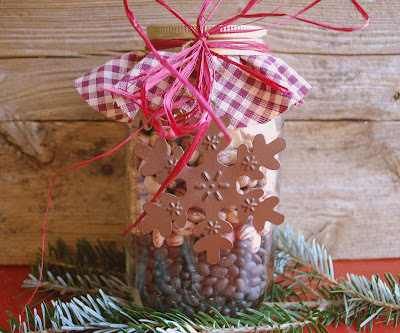 People really seem to love homemade gifts from the kitchen. 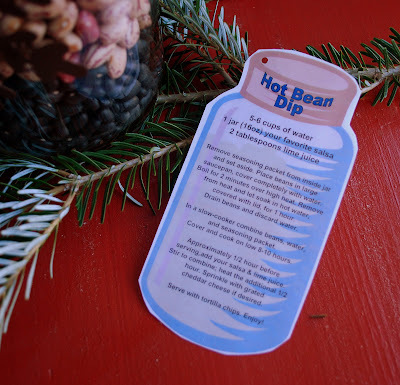 Here's hoping that lots of bean dip will be cooking in crock pots all over Rhode Island this winter!